I don’t know about you, but it’s the exception rather than the norm to get good customer service these days. So that means it’s important to make sure your business is providing the best service it can. Here are 10 ways your business can provide the best customer service 365 days a year. 1. Make sure that every “first touch” makes a good first impression. First opinions are formed within the first 10 seconds. You never have a second opportunity to make a warm and welcoming first impression. 2. Show appreciation to your customers. Thanking customers in a meaningful and thoughtful manner on every customer encounter shows them you care and appreciate their business. 3. Review your letters and email communications. Ensure they sound welcoming, personalized and make your customers feel important and appreciated. And they will, in turn, treat your customers the same way. Customers notice and appreciate when a company appreciates their associates. 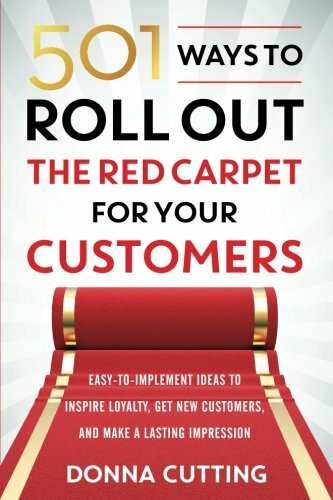 501 Ways to Roll Out the Red Carpet for Your Customers Great customer service is the new competitive advantage in today's busy world. Implement these 501 tips one at a time to create raving fans. By not only responding to their direct inquiry but by providing them with additional useful information. Customers often enjoy learning more about a potential purchase than what’s written on a tag or on a website. 6. Understand that the underlying ingredient of customer service is “helping” people. Make sure that everyone on your team approaches servicing customers from a helpful perspective. It will almost guarantee a great customer service experience. 7. Say hello and smile. In a retail store environment to make customers feel comfortable about returning an item and offering special attention to help them find what they need. Customers don’t like making returns. Make the return process an enjoyable and non-defensive process. Customers will really appreciate it! 9. Listen to customer comments. When you hear people say, “This is the first time I used your site”, “I just moved into the neighborhood”, “I just happened to stop by,” etc. and take those opportunities to engage the customer to build a relationship and lifetime of loyalty. 10. It all starts with the first hello. The final piece of advice for guaranteeing repeat business, generating positive social media posts, and making customers feel your company cares, all starts with the first hello in person. over the phone, or the first click of the mouse. Your frontline team members are the “voice of the company.” When you find great people who can make every customer feel welcomed and important, make sure you continually thank those special folks and reward them appropriately. Remember to make sure that your customers know that your company cares about them as a person first, customer second, 365 days a year! This guest post is by Richard Shapiro, the founder and president of The Center For Client Retention.